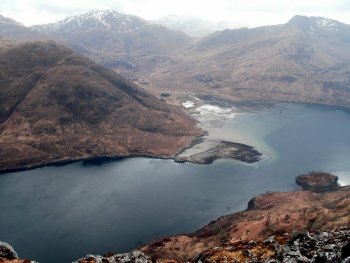 Knoydart, Skye and Wester Ross: West... Ross: West Coast Walks. Click here for a Free Brochure. The Knoydart Peninsula, a remote and beautiful peninsula often described as the last wilderness in Scotland. Our walking and hiking expedition combines the very best of wild camping with some fantastic mountain ridge walking. Our Knoydart expedition begins when we meet in Mallaig and board our boat for the passage to the head of Loch Nevis - enjoying a real feeling of pioneering adventure. We land on the shores of the loch and set up camp beneath the awesome flanks of Sgurr na Ciche. Day Seven - Boat journey across Loch Nevis and a return to civilisation. Following a relaxed breakfast, we board the boat and leave Knoydart, keeping our eyes open for Minke Whales which are often spotted in these waters. For those travelling by rail, we arrive in Mallaig in time to catch the mid-morning train back to Glasgow. A winter walking holiday in Knoydart is an exceptional experience. Experience the challenge and beauty of this area, while learning the essential winter skills required to safely travel through Scotland's mountains. We drive from Edinburgh to Mallaig, from where a short boat ride takes us into Knoydart. On arrival at our lodge, our guide will explain the format of the trip and ensure that everyone is correctly fitted with ice-axes and crampons. Dinner and a roaring fire complete the evening. Using a Land Rover, we bypass the long walk-in and maximise our time on the hill learning essential winter skills. Leaving our vehicle behind, we climb above the snowline to spend time learning the essentials before completing a high-level journey, returning to the Land Rover. Returning home, we stop at the Old Forge, the remotest pub on the UK mainland! Ladhar Bheinn is truly one of the great mountains of the UK. Again using the Land Rover for the initial approach, we make a rising ascent over rocky steps and past the steep gullies that split the soaring cliffs of Coire Dhorricail to the summit. This is a hard-earned but magical spot – you’ll sleep well tonight! We enjoy a shorter route on our final day. An ascent of Sgurr Coire Choinnichean is especially satisfying as it provides wonderful views of the whole Knoydart Peninsula. There is time for a final visit to the Old Forge before returning to Mallaig and continuing south to Edinburgh. 2007 DATES: 18-21 January; 1-4 February GRADING: Challenging Please note - price excludes flights The itinerary may be subject to change at the discretion of the Wilderness Scotland Guide having regard to weather conditions and other factors. Start: Edinburgh 1200 hours Finish: Edinburgh 2000 hours. Knoydart Knoydart, the northern edge of the Rough Bounds is one of the most evocative names in Scotland. This text offers a history of Knoydart from the earliest times to the present day. A remote and desolate peninsula, its name derives from Viking settlers who only reckoned it worth three ouncelands, compared to five for the island of Eigg. Its warlike but impoverished inhabitants caused endless problems for their neighbours during the 17th century before becoming notorious in the 18th century under the leadership of Coll of Barrisdale. His protection racket has bequeathed the word "blackmail" to the English language and he was notorious across Scotland. For the Jacobites, as well, Knoydart was a fertile recruiting ground. In the 18th and 19th centuries the area suffered large scale emigration, partly as a result of the brutal clearances of 1853. A further long century of decline followed, during which sheep and then deer were preferred to people. In 1948 discontent swelled again and it became the scene of the famous land-raid by the Seven men from Knoydart. It has changed hands more often in the last 150 years than in the previous 700 years. The land continues to lie at the heart of the Knoydart problem and the book attempts to place events in their larger historical context. This is the struggle of a community to preserve itself against the harshness of the environment and the cynical exploitation of man.